Taylor Schilling, Josh Groban, & More Check Out Broadway's New Hit 'Hadestown' on Opening Night! Taylor Schilling walks the red carpet while attending the opening night of the new Broadway musical Hadestown on Wednesday night (April 17) in New York City. Josh Groban attended the show with his girlfriend Schuyler Helford and they met up with Chasten Buttigieg, the husband of Democratic presidential candidate Pete Buttigieg. Chasten also met up with Jujamcyn Theaters president and fashion insider Jordan Roth and his producer husband Richie Jackson. Josh and Ingrid Michaelson, who was at the show too, previously worked with Hadestown director Rachel Chavkin on the musical Natasha, Pierre and the Great Comet of 1812. More stars at the event included Riverdale‘s Casey Cott, 13 Reasons Why‘s Tommy Dorfman, The Other Two‘s Helene Yorke, Glee‘s Alex Newell, Smash‘s Krysta Rodriguez, and Broadway legends Ben Vereen, Daphne Rubin-Vega, and Lillias White. Hadestown has amazing reviews and is bound to be Broadway’s next big hit. Get your tickets now on Ticketmaster! Julia Louis-Dreyfus walks the red carpet at the premiere of Veep‘s final season on Tuesday night (March 25) at Lincoln Center’s Alice Tully Hall in New York City. The Emmy-winning actress was joined at the event by her co-stars Tony Hale, Anna Chlumsky, Matt Walsh, Gary Cole, Sam Richardson, Sarah Sutherland, and Clea Duvall. 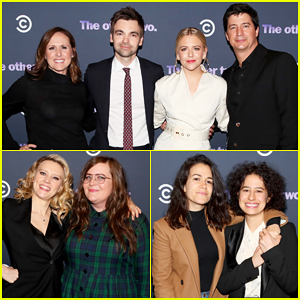 Also stepping out to show their support were former Girls co-stars Lena Dunham and Zosia Mamet (with longtime love Evan Jonigkeit), Broad City‘s Ilana Glazer and Abbi Jacobson, Succession‘s Sarah Snook, 2 Dope Queens‘ Jessica Williams, and The Other Two‘s Helene Yorke. The final season of Veep premieres on March 31 and will have seven episodes. Did you know that Julia has won the Outstanding Lead Actress in a Comedy Series award for all six previous seasons of Veep?! FYI: Julia is wearing a Marc Jacobs dress. Anna is wearing a Whistles dress, Tabitha Simmons shoes, and jewelry by David Yurman and Jeffrey Levinson. Zosia is wearing a Christopher Kane dress and Ara Vartanian jewelry. Jessica is wearing a Peter Pilotto dress, Frances Valentine shoes, a Brahmin bag, and Vela rings. Lena is wearing Tory Burch. 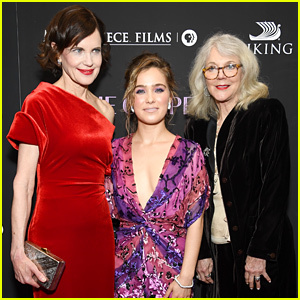 Elizabeth McGovern, Haley Lu Richardson, and Blythe Danner team up for the premiere of their movie The Chaperone! The 57-year-old Downton Abbey actress, the 24-year-old Five Feet Apart star, and the 76-year-old Will & Grace actress attended the event held at the Museum of Modern Art on Monday (March 25) in New York City. They were joined by their co-star Victoria Hill and director Michael Engler. The Other Two actress Helene Yorke was also there to show her support. The group was all smiles as they posed on the red carpet. Check out Haley‘s alien-inspired nail designs in our gallery! The Chaperone takes place in the early 1920s and tells the story of a Kansas woman who finds her life forever changed when she accompanies a young dancer on her fame-seeking journey to New York City. Don’t miss it when it hits theaters this Friday (March 29)! 'The Other Two' Cast Get Star-Studded Support at Series Premiere Party! Molly Shannon, Drew Tarver, Helene Yorke and Ken Marino strike a pose together on the red carpet while attending the series premiere party for their Comedy Central show The Other Two held at Dream Hotel Downtown on Thursday (January 17) in New York City. The four stars were also joined at the event by their other cast mates Case Walker and Daniel K. Isaac, as well as creators Chris Kelly and Sarah Schneider. 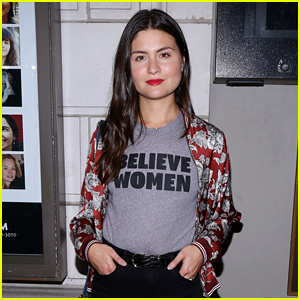 In attendance to show their support was SNL‘s Kate McKinnon and Aidy Bryant, Broad City‘s Ilana Glazer and Abbi Jacobson, singer Leland, The Good Place‘s William Jackson Harper and D’Arcy Carden, and William‘s girlfriend Ali Ahn. The Other Two follows the story of aimless siblings Cary and Brooke Dubek’s lives are thrown into even more chaos when their teenage brother suddenly becomes a huge pop star. Theo James Suits Up for 'Backstabbing for Beginners' New York Premiere - Watch Trailer! Theo James is dapper in a suit as he hits the red carpet at the premiere of his latest film Backstabbing for Beginners held at the iPic Theater at Fulton Market on Tuesday (April 17) in New York City. The 33-year-old actor was joined at the event by the film’s writer-director Per Fly, producer Nikolaj Vibe Michelsen and author Michael Soussan. Also in attendance to show their support was The Punisher‘s Kobi Frumer, The Good Fight‘s Helene Yorke, Corey Cott and model Nimue Smit.